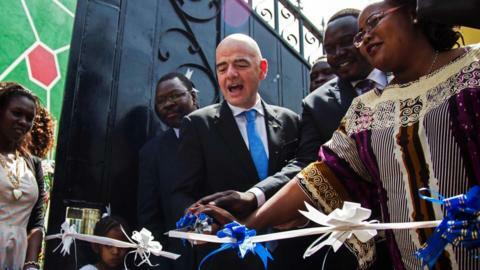 South Sudan Football Association's new office was opened by new Fifa president Gianni Infantino on Wednesday. The Italian, who won last month's Fifa elections to succeed Sepp Blatter, inaugurated the facility in the war-torn country's capital Juba. He also attended the 2017 Africa Cup of Nations qualifier between South Sudan and Benin, which the away side won 2-1. South Sudan played their first official friendly, against Uganda, in July 2012. It was only in 2011 that organised football was first played in South Sudan, after the country gained its independence from Sudan. South Sudan officials dressed Infantino in traditional robes and made him dance. Officials also produced a large cake to celebrate the Italian's 46th birthday. After gaining independence from Sudan in 2011, South Sudan erupted into civil war in December 2013. Infantino, who won last month's Fifa elections to succeed Sepp Blatter, is due to visit South American football confederation CONMEBOL from 28 to 29 March in Asuncion, the capital of Paraguay.